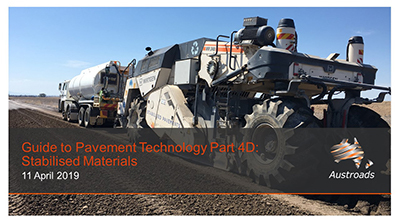 This webinar, presented on 11 April 2019, gives as overview of the key changes to the Guide and the significant advances in the areas of stabilisation or road pavements. 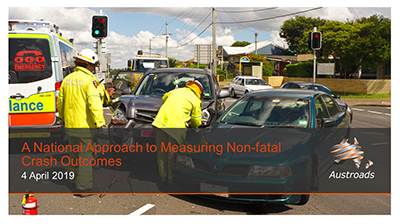 This webinar, presented on 4 April 2019, gives an overview of an Austroads pilot project to improve the measurement and reporting of serious injury crashes. 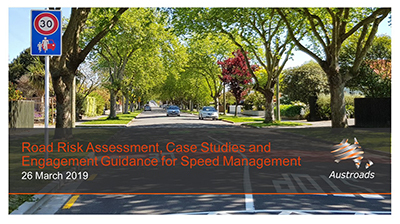 This webinar, presented on 26 March 2019, provides an overview of Infrastructure Risk Rating - a simple road assessment methodology designed to assess road safety risk at a network level, primarily as an input to the speed limit setting process. 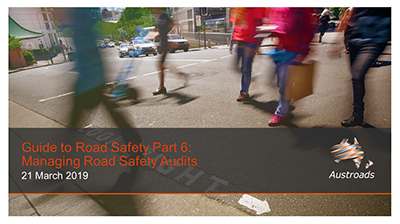 This webinar, presented on 21 March 2019, provides an overview of the new Guide to Road Safety Part 6: Managing Road Safety Audits. 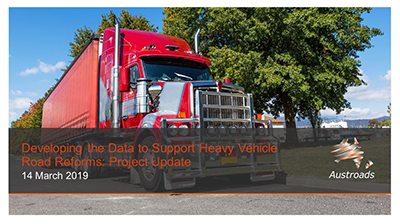 This webinar, presented on 14 March 2019, provides an update on the Austroads’ project to develop the data to support the Heavy Vehicle Road Reforms. 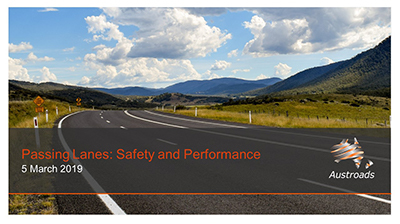 This webinar, presented on 7 March 2019, provides an overview of Austroads' long-term pavement performance study. 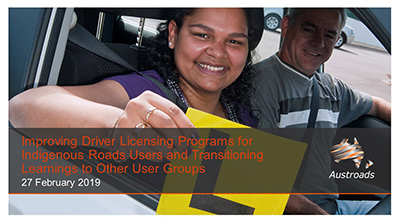 This webinar, presented on 5 March 2019, provides an overview of the benefits associated with passing lanes for guidance for practitioners. 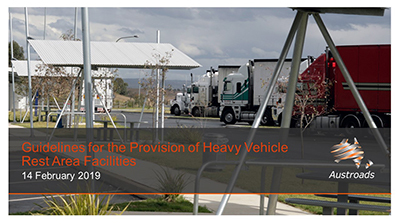 This webinar, presented on 14 February 2019, provides an overview of the Austroads Guidelines for the Provision of Heavy Vehicle Rest Area Facilities. 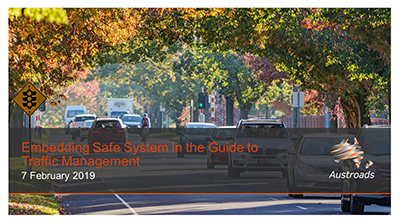 This webinar, presented on 7 February 2019, provides an overview of a Safe System review of the Austroads Guide to Traffic Management (AGTM).